Noel Kingsbury's blog is one of the few that I follow and enjoy. He gives interesting thoughts and insights on gardening in terms of where it’s at, where it’s going especially on a more international level, and is really great at giving an overview on a topic and explaining the history of things in laymen terms. Stimulated by his writing I have wanted to write to him on many occasions. In one of his blog posts I read that sick of Brexit he was strongly considering moving to Portugal, where there was so much more flora to be explored and the potential of them to be realised, and if anyone was interested in seeing his garden whilst he was still there they should get in contact with him. I was in the States at the time but upon my return many months later, I saw that he mentioned that he was getting rid of some horticultural books in preparation of moving. So I decided it was now or never. after a little correspondence I asked him if it was still sensible to visit in December and he said that there was winter interest and that I would probably be interested in seeing his trial beds. 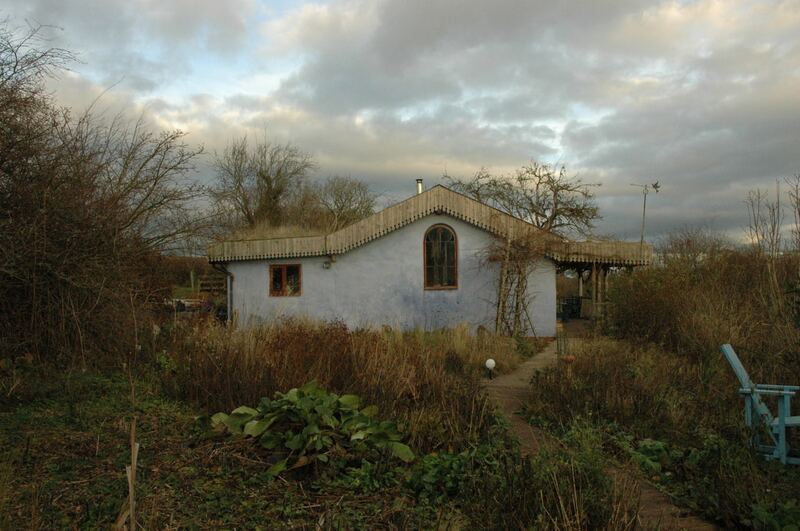 Photo 1: Noel Kingsbury's garden. His former B & B Guesthouse with green roof. December 2017. His garden was situated near the border town of Hay-on-Wye, known for secondhand bookshops and its literary festival. I went with my friend Rachael Dodd who is also a horticulturist and had also trained at Great Dixter. The sun broke through the moody skies when we got there early afternoon and cast a golden glow on the garden. Perennials and ornamental grasses were that wintry brown and straw colour, trees and shrubs were bare, but the general ground was that eternal green because the UK is relatively mild in winter and so wet especially in Wales. They were in the process of dismantling some of the garden, with some plants already being dug up and transferred to different places. Some friends of his was taking away some furniture as we spoke. He took us straight to the trial beds and showed us what he had been doing there. 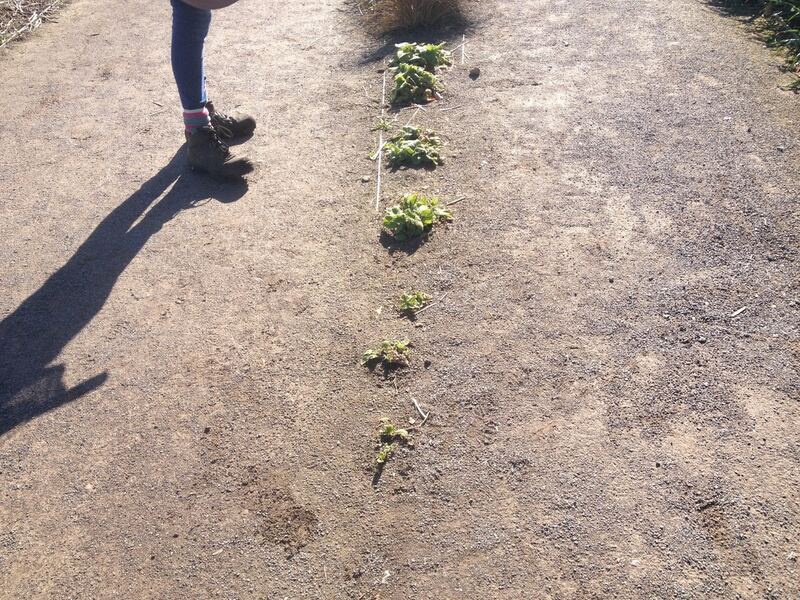 They were one square metre, about seven of them and had nine types of plants in each. The soil there is generally moist and very fertile, and the key function for the trial beds was to try and find plants that can stand up to the weeds that occur there, help suppress them even and be informative for a low maintenance weed resistant planting. This research can be seen in connection with his doctorate for research on long-term perennial planting, and complements the work by people like professors James Hitchmough and Nigel Dunnett. 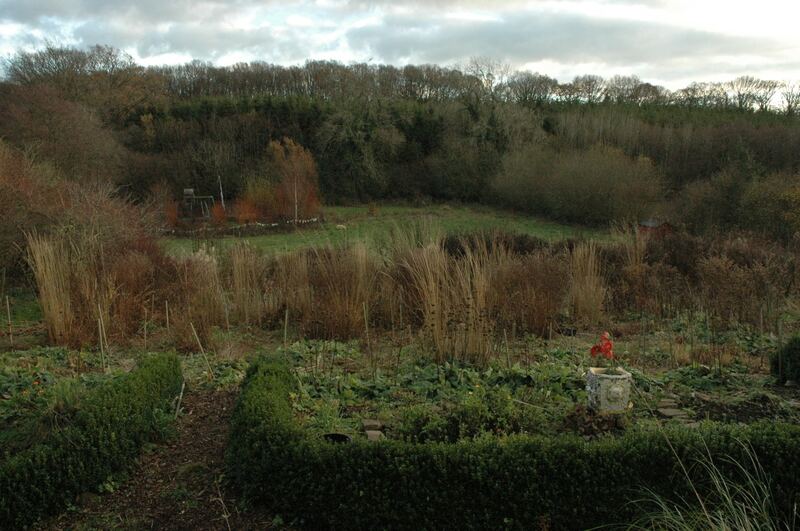 Photo 2: Noel Kingsbury's garden with trial beds and surrounding view. December 2017. 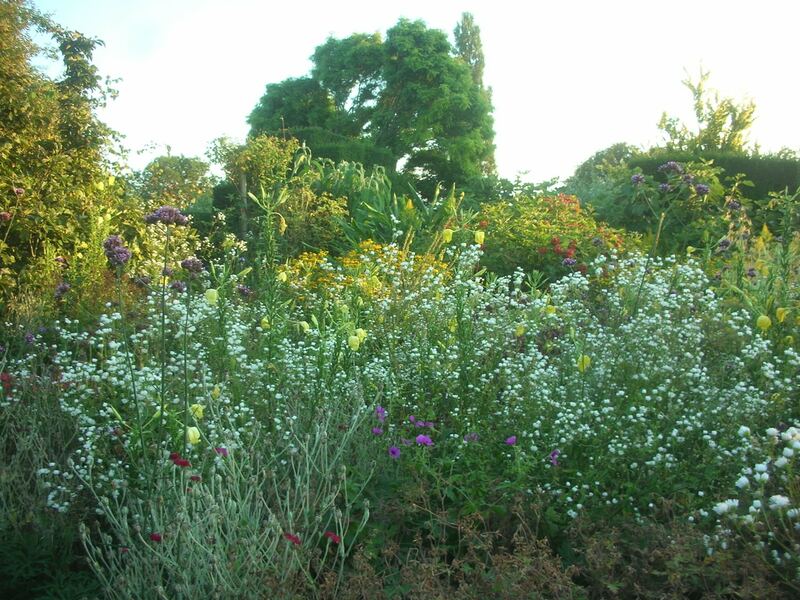 There is a similarity to this and the method of gardeners using thug plants to combat or counter other thug plants like Christopher Lloyd and Pam Lewis, and the ecological way of planting according to site strongly advocated by Beth Chatto. These research squares honed in on how different vigorous plants actually grew and how they went about colonising an area. They helped identify the virtues of individual plants - like how Phlomis russeliana generally grows congenially with other plants but is an opportunist and will grow very willingly in any available gap. I have witnessed how resilient this plant is myself - at Wisley, in one of their landscaped areas they have these beds with very long thin corners that experience a lot of foot traffic near them. They are one of the most difficult growing conditions and the only plants that even remotely survives in them are Phlomis russeliana. 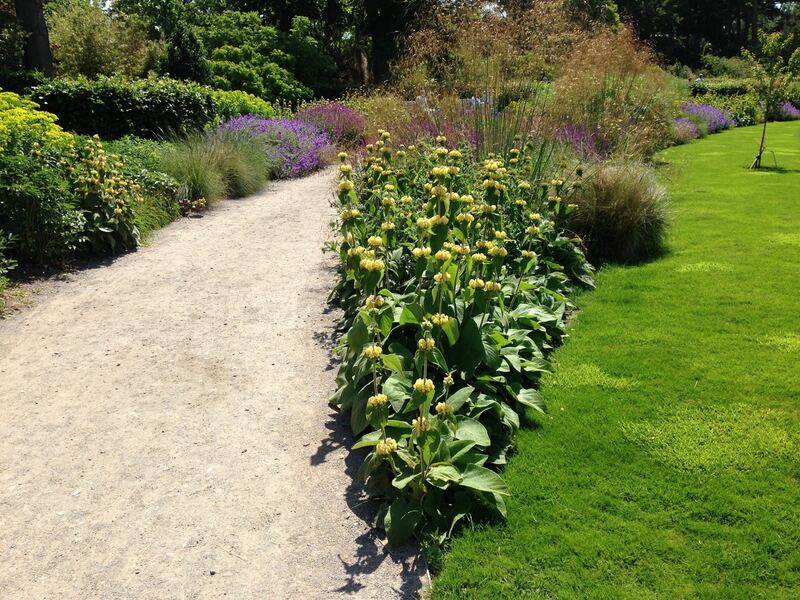 Photo 3: Phlomis russeliana still toughing it out on a very long thin corner of a bed at Wisley. April 2015. Photo 4: Phlomis russeliana colonising another corner very well. Wisley. June 2015. He points out that Symphytum a strong grower is not monocultural in its habit and does like to share space, that Geranium endressii with its clump forming and sprawling habit is a useful plant in this part of the world, that Geranium phaeum also moves around to fill in gaps, whilst something like Solidago rugosa stays as one solid clump and expands its mass slowly. As well as how plants colonised it looked at how specific plants worked in relationship with each other, for example the beds were created initially to look at how certain types of grasses grow amongst a selection of perennials. He found that Calamagrostis did a better job of growing through Phlomis than Panicum and Miscanthus did. He carefully charted the progress of these beds on grids, and it was fascinating to see the pattern of movement of the plants over a few years. The clear demonstration of this is very helpful. I love the work of people like Hitchmough and Dunnett and I think their intentions are good, but that ride to low maintenance is still a bit bumpy and some of the different sites they have designed and implemented are more successful than others for different reasons and often dependent on the people who manage the spaces. The Olympic Park is excellent and managed by not so skilled contractors, but it helped that it had the luxury of changing and bringing in completely new and sterile soil. Hitchmough’s meadows at Oxford Botanics and Tom Stuart Smith’s private garden work really well also - these sites are well managed; it probably helps that the size of these gardens and the garden teams are quite manageable, with the consistency of the meadows being overlooked and managed by the same person over a number of years. Photo 5: James Hitchmough's meadow at the University of Oxford Botanic Garden - a palette of North American and South African plants combined. July 2015. 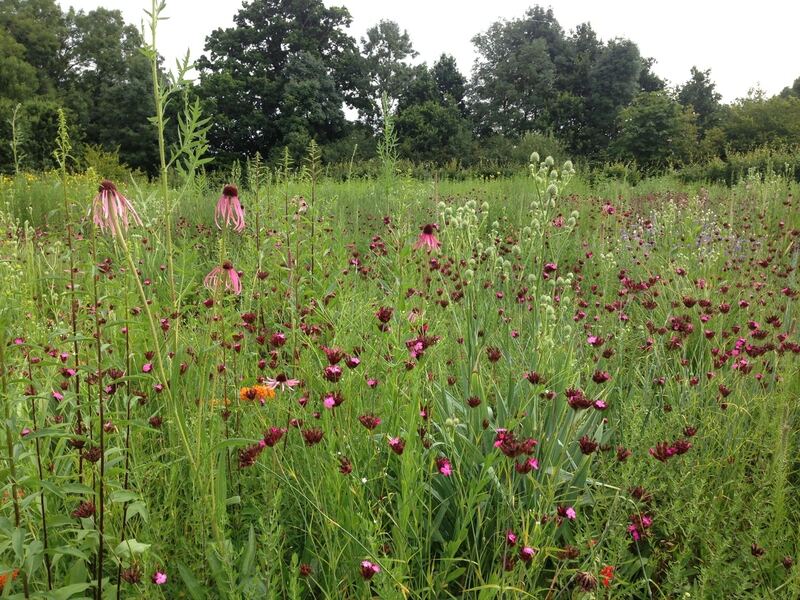 Photo 6: Hitchmough's meadow in Tom Stuart Smith's private garden with Echinacea pallida, Dianthus carthusianorum and Eryngium yuccafolium predominantly in bloom. July 2016. From my direct experience, I know that it is at least advantageous that a skilled gardener with a keen eye and a good editorial sensibility helps manage these sites, especially at the crucial establishment stage. It can be the case that they do not require as much work as traditional herbaceous borders, but they are best when they have someone in charge of them that have an understanding of what they are looking at - being able to identify plants at a very young/ small seedling stage, to be able to decide which plants are weeds and which ones are not, to have initiative and make informed decisions of how to edit the planting and keep it in line with the designer’s vision to achieve the best aesthetic impact. They would understand how plants move and how the composition of year three will probably be very differently from year one (e.g. some plants will be more readily to take over than others; some are short lived perennials and may die back, but self sow and may take time to re-establish and be more prominent again). When you look at it like this, it seems less like just any old contractor can do it and more aligned with the training I had at Dixter, where we were taught to key our eyes in to what plants were doing, manipulate and maintain them accordingly to maximise its successional display potential, including making use of self-sowing plants. Photo 7: One of the flower beds at Great Dixter with Erigeron annus, Verbena bonariensis, Lychnis coronaria and evening primrose threading through plantings. 2013. Low maintenance designs definitely appeal to me, but as well as being questionable sometimes in just how low maintenance they are, there is one aspect of it that makes me anxious because the reasons for doing them are often driven by under-resourced situations, but as a way to still try and retain aesthetic and ecological impact. Although I don't think it is its intention, there is a sense of threat that it could take the art, the skilled gardener and human satisfaction out of the equation. I am finding that horticulture is attracting more artistic individuals who would like to have some creative input and autonomy to the work that they’re doing, and fulfillment in all different aspects of their lives. There are already some tension and conflict in this with the industry, as though there are possibilities and potential for that, a lot of gardens just want good maintenance staff to carry on doing things the traditional way or strictly according to a design that already exists, there is no clear structure in the industry for promotion or for development in this way, as well as this being the case financially (gardeners are notoriously not well paid). In this world of technological advancements, awareness and knowledge this seems to be the case in other industries and professions too. Horticulture is a place where so many generous people and a sharing nature are found, where a lot of people are in it because they love what they do, and where its foundations are underpinned by things like beauty, nature, conservation, diversity and people, one feels that it should be one of the places that revolutionises work to be more satisfying, empowering, enables people and utilises their full potential. When I asked Noel whether he thought there was a place for the trending design works and the skilled professional gardener, I was pleased to hear that he thought there was and that he had been thinking of setting up a postgraduate programme that helped bridge this gap. I personally think that these designs can actually be an opportunity in marrying some of these discrepancies together, and create interesting work for skilled creative gardeners. 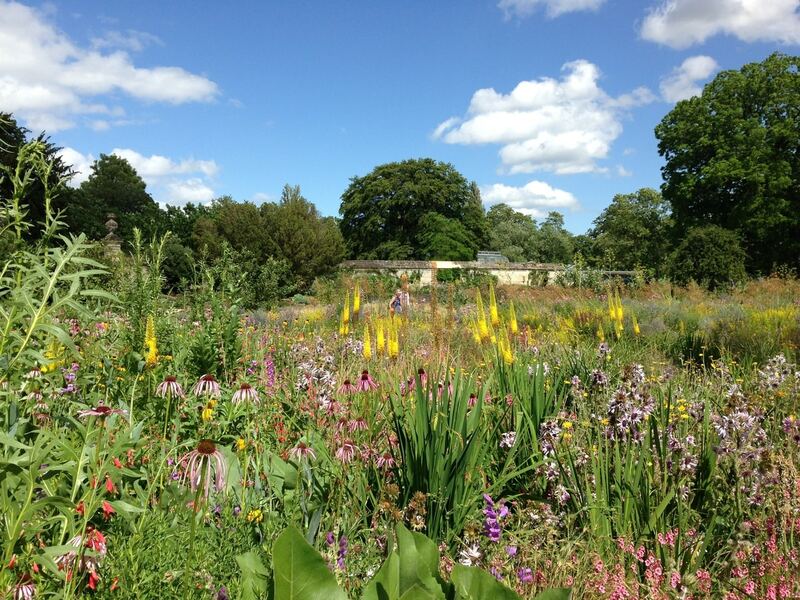 Noel commented that Trentham Gardens was a good example of where gardeners have some autonomy maintaining designed landscapes and it is successful and looks good. I look forward to to visiting here when I get further up North. So was low maintenance successful at Noel's? - in comparison to some methods and gardens it was. He doesn't stake his plants, aims to just do one big cut down of everything once a year in November leaving the grasses, and a chelsea chop the following year. Although using selective plants to combat weeds has been effective, he still does find it hard to keep on top of the weeds for such a large and wet garden. I was also keen to ask Noel’s opinion on the future of small independent nurseries in Britain, if he feels that there is a possible future for them and if there are ways for them to survive in this day and age, remain relevant and be sustainable. Noel started out with running his own nursery and I have done a lot of research on them myself, being concerned with their decline, because of how they are fundamental in the heritage, progression and high standards of UK horticulture. He was optimistic about this too, and felt that one of the ways for them to go was also to do trial plots and attract people to buy plants through these. This is not dissimilar to Germany where experiments like this have resulted in partnerships with nurseries to produce perennials that are easy to manage, robust and aesthetically pleasing for different settings. As there are different kinds of environments and climate zones there is room for different combinations and trials - a way in which nurseries can still retain an unique edge based on geological niche. He himself has offered his plots for businesses to take on.